In the commercial, Jones reacts with disgust to the clip of Ukrainian dancers performing a traditional dance. She squints and asks: “Why are we watching this again?” The man, playing the part of her husband, responds that since he pays for all of his channels, he forces himself to watch them all. Jones goes on to roll her eyes and moan: “I’ll watch anything except this.” The man switches to the next channel, revealing the clip of a disgusting bug crawling from under the tree bark. That makes Jones agree to switch to the previous channel. The pair goes back to watching the Ukrainian dance, with exasperation and discontent. Verizon could have hardly picked a more sensitive topic for the Ukrainians, whose culture and identity is under a massive attack by Russia. Thousands of lives have been lost in the ongoing military conflict inUkraine, while prominent Russian demagogues like Alexander Dugin derided their culture as stemming from the gutter. Anti-Ukrainian propagandists like Valentina Lisitsa called Ukrainians “dog s**t,” “pigs” and “animals,” making fun of their allegedly “primitive” culture. The head of RT (formerly known as Russia Today) declared Ukraine dead. [UPDATE] In response to numerous complaints, including an official letter from the Ukrainian Embassy,Verizon modified the commercial. The old commercial was made “private” on YouTube, but was not removed. The modified version of the commercial was posted on Verizon’s YouTube channel on June 24, 2015. 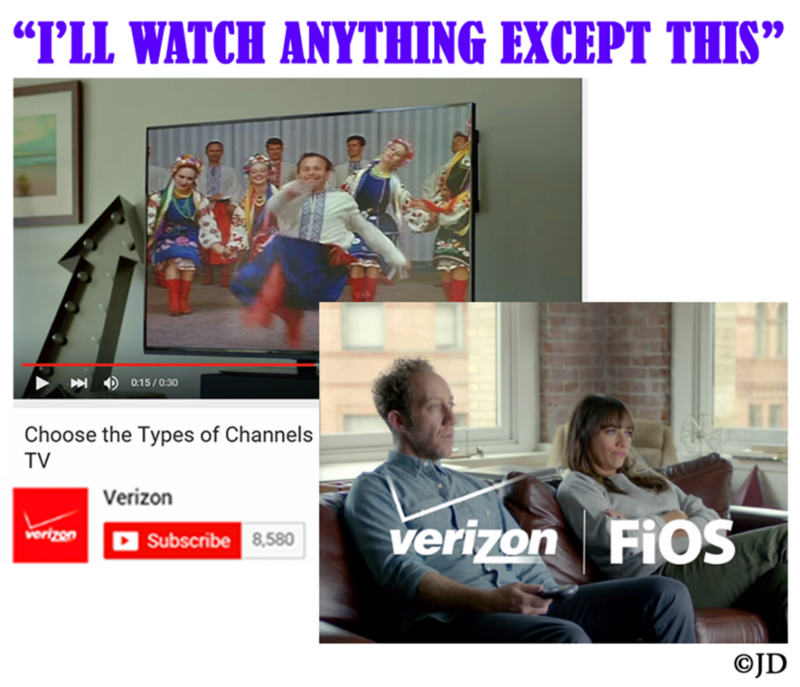 Now Verizon joined this despicable cult of ethnic hatred against Ukraine with their deeply offensive commercial. Ukrainians all over the world are insenced and offended by the campaign that assails their culture, especially in a time of war.